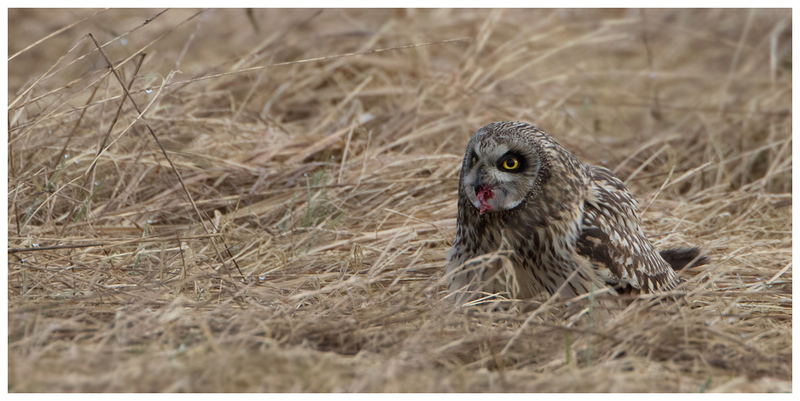 Anyone who follows me on Twitter or watches my Flickr stream will be well aware of what I have been focusing on of late. 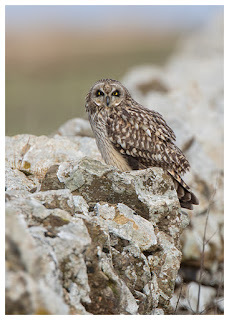 Short-eared owls, and the half dozen or so that have chosen to winter in the picturesque Cotswolds. I have visited the site probably more times than is healthy, but I adore these owls and try to make the most of them, as they will soon disperse and it might be several years before such a convenient gathering is accessible to me again. The area isn't new to me. 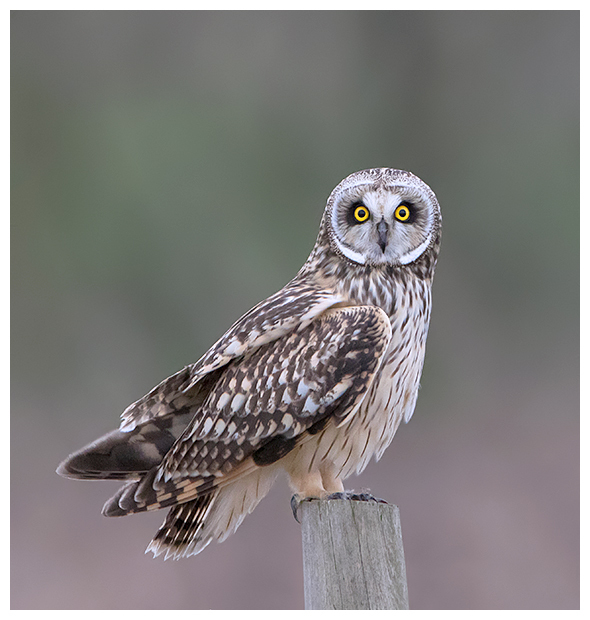 I have seen little owls here in the past and enjoyed one of the local barn owls putting on a show, alongside the road one afternoon, so when I saw reports of short-eared owls there late last year, I knew exactly where to look for them. In December, the owls seemed to be mainly sparring with each other when they showed, and that was usually late afternoon if at all. Having observed the owls since then it seems likely that they were sorting out territory, as when I have visited recently, there is usually only one of the owls that hunts over the meadow closest to the wall, where everyone watches from. This particular individual also prefers to hunt all day, and can be seen from dawn on some days, quartering the fields in search of breakfast. The resident raptors have had to play second fiddle to the owls, with the barn owls being generally chased off the fields. 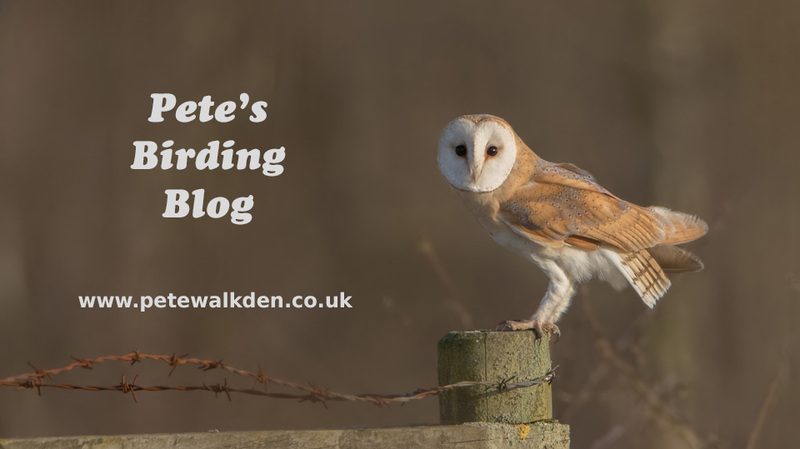 At the start of the week the landowner put up a barn owl box, presumably after seeing the barn owl around this area, and by the end of the week, I was pleased to see the barn owl sat outside it, so that is great news for the folks who made the effort to help. Also around are merlins, though I have only had fleeting glimpses of these as they hurtle through at pace, and kestrels, which give as good as they get with the short-eared owls. 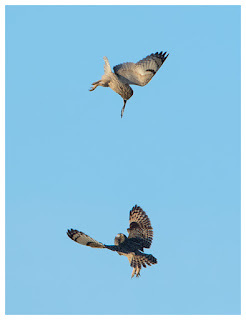 Buzzards are plentiful of course and it's encouraging to see that red kites are starting to populate the area too. 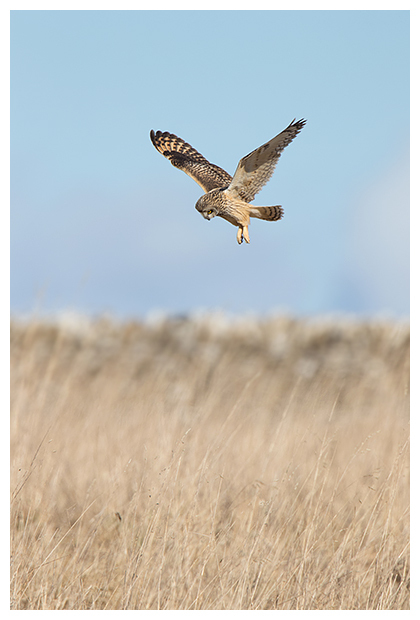 Add in the hen harrier that has been spotted, and it's clear to see that the area is rich in wildlife and perfectly suited to birds of prey. The area is fairly exposed to the elements, so standing around for hours on end isn't all that pleasant, especially when northerly winds are cutting through you. However, watching the owls use the wind has been interesting. When there is a breeze, they use it to hunt into, so it slows them as they float over the meadow, scanning the ground for movement and listening for anything making a sound. 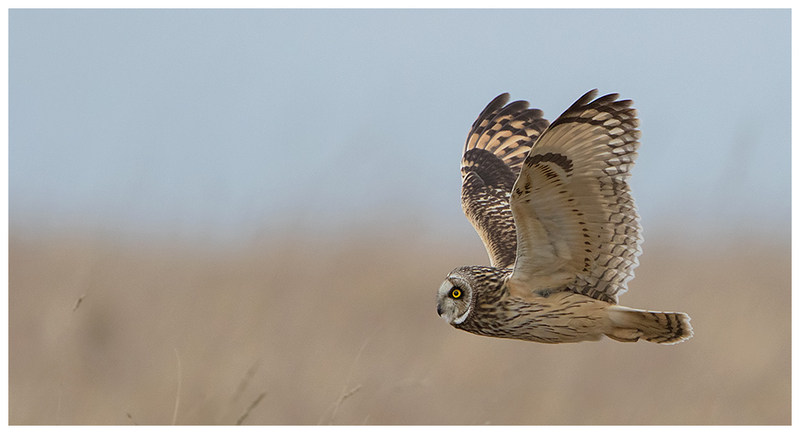 In stronger winds, they still seem to be able to detect prey, but photographing them is more tricky, as they can change direction in the blink of an eye, and be dozens of yards away in a split second as their large wings catch the gusts. 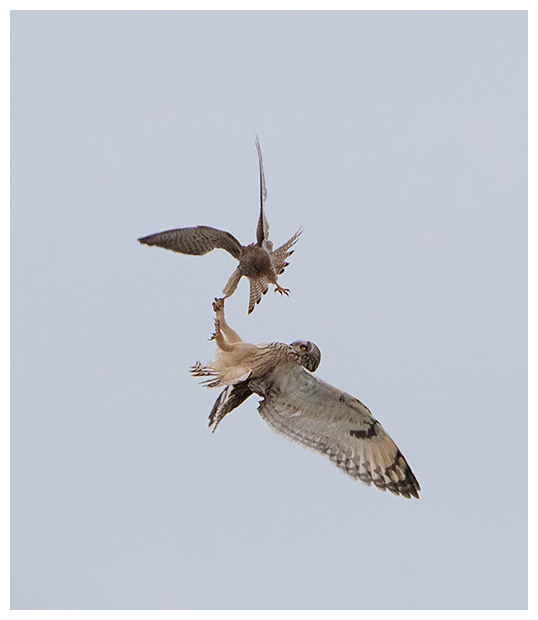 When it is calm, they have shown great skill with their ability to hover, and while not being quite as good as kestrels, they still manage to hang above an area of interest, and drop down head-first to pounce on prey below. 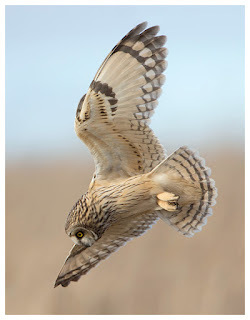 This diving down is also something difficult to capture, as they can be floating along one second, and in the next, they have angled their wings and tail, and dropped like a dart into the grasses to grab some prey. 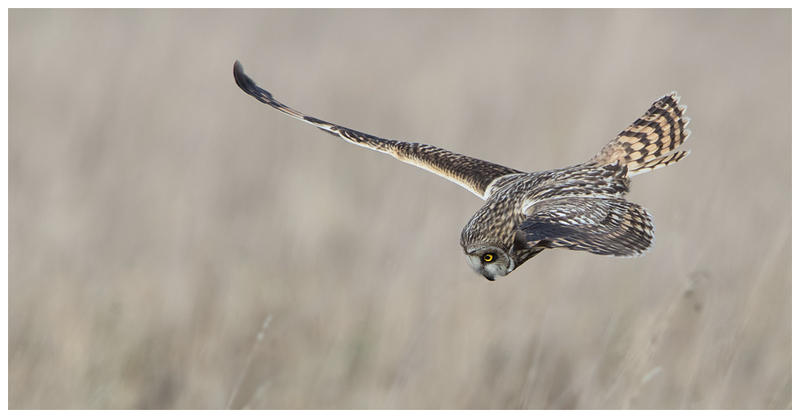 But with good timing, the wing and tail positions used show how agile they are, and skilled to go from flying into diving so quickly. 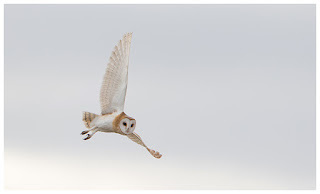 Once on the ground, the owl grabs the prey in its talons, with its wings hugged around, mantling it, whilst looking all around somewhat nervously in case of any other owl or other bird might try to steal the catch. 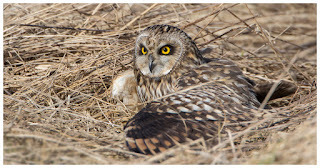 Once caught, the owl may consume the prey where it has been caught, stash it elsewhere in something akin to a larder, or fly to somewhere it feels more secure to eat it. I was surprised to see how easily they can tear up prey too. 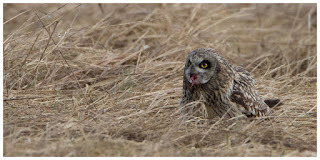 I expected the owl to gulp down the whole thing, but with ease, it tore the poor vole into lumps, and swallowed it. 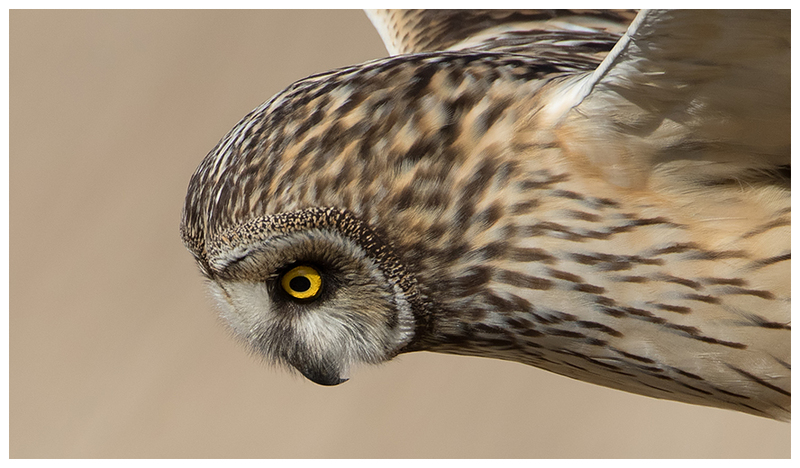 They must have sharp beaks, strong talons and powerful neck muscles. 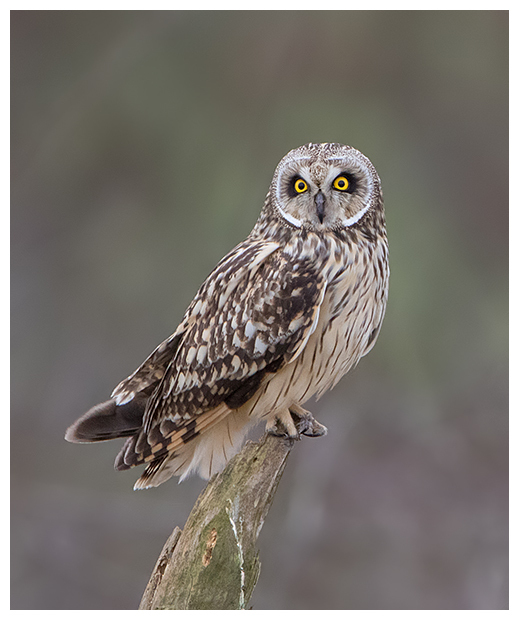 I have been fortunate to enjoy some very close views of the owls, and one thing that is clear is that they can change their facial appearance quite drastically, depending on their mood. 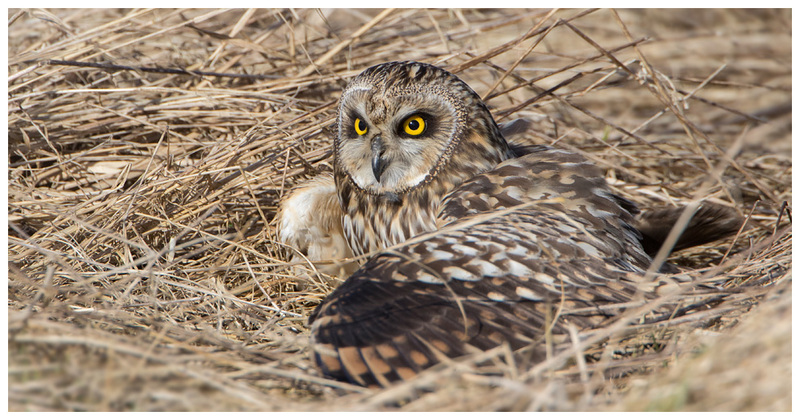 The composite shot below is of the same owl. The left is the way it looked as other owls hunted nearby, and it had raised its "ears" perhaps in a show of defence, whereas the right side is the look it had when it first landed, somewhat cautiously scanning the area to check that it was safe to remain there. 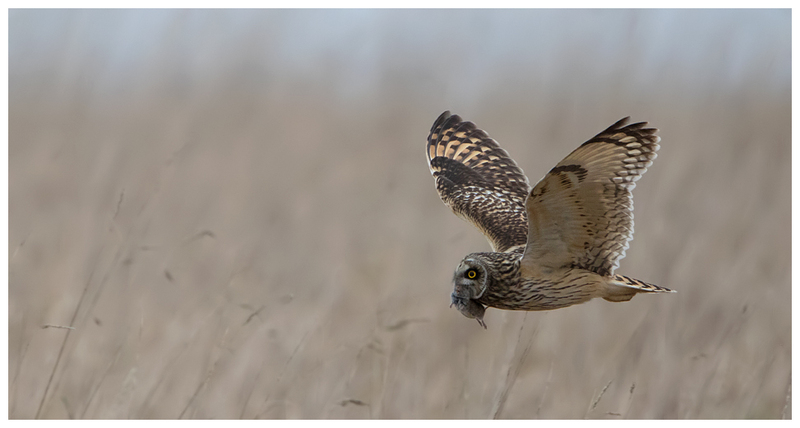 With any gathering of owls like this, it has brought crowds of admirers. This can be a problem in terms of getting to see the owls close up, as they tend to avoid the people in general, though their tolerance is pretty good, and they're happy to fly close or over the top, but usually prefer to perch further off. On quiet days I have been fortunate to have an owl perch up right next to me, probably because I was hidden between my car and a stone wall! 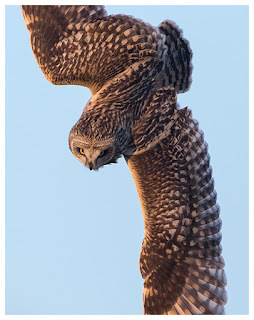 By being careful and applying some common sense, a perched owl can be approached. Fairly obvious really. Wait for it to look the other way and creep up, being as quiet as possible. Play statues when it looks in your direction. And hope no traffic thunders by to undo all your hard work. 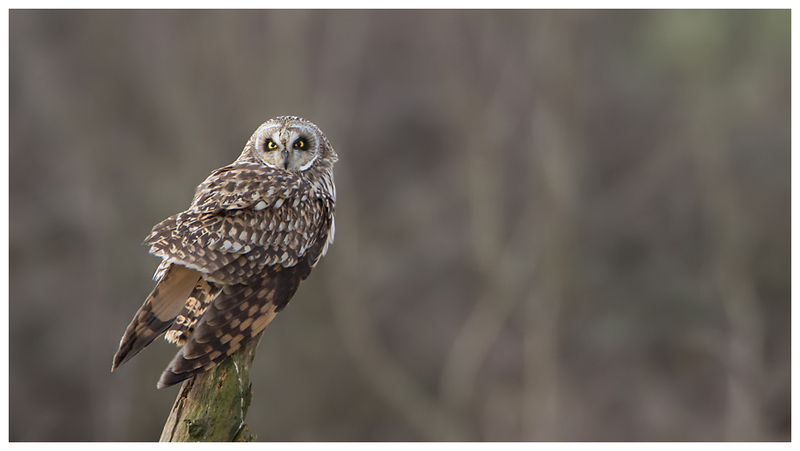 There are benefits to the crowds, with a great deal of banter going on between us all, which can be invaluable in the hours of waiting for an owl to appear, especially on such cold days. I have made some new friends over this winter and they're fantastic characters. One of the many benefits of this passion of mine. It won't be long before the owls start to disperse though. Much to the relief of the locals who live in this beautiful and normally tranquil part of England. But they have left me with memories to treasure, and rather a large number of images to enjoy!